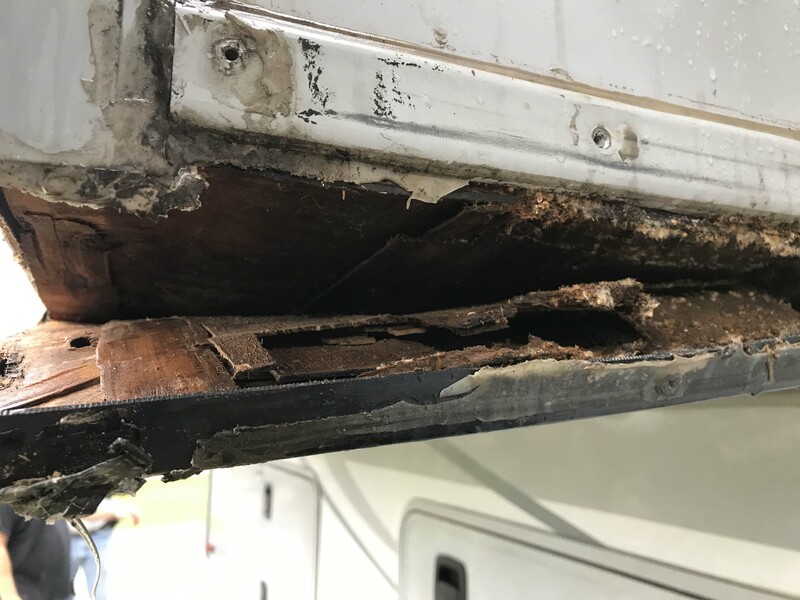 Lee has been concerned about the floor to our slide where our closet and washing machine is for some time, but if you’ve been reading the blog you know we haven’t had much luck with RV repairs in the past. We knew this would be a major job, and although our friend Bill replaced his floor by himself, after talking it through with him Lee was concerned about attempting to do ours with limited time and limited access to parts. 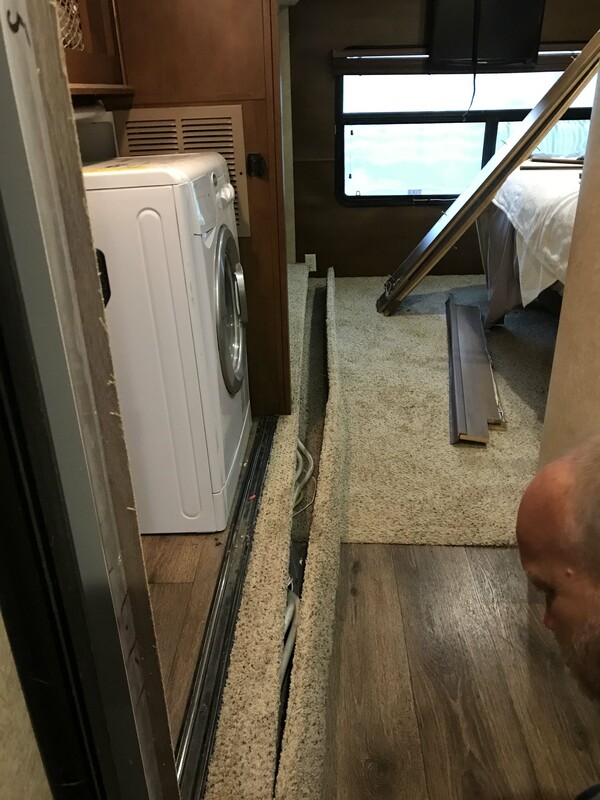 Part of the problem was the washing machine would need to be completely uninstalled to replace the floor, and Lee thought it would definitely be a two person job. 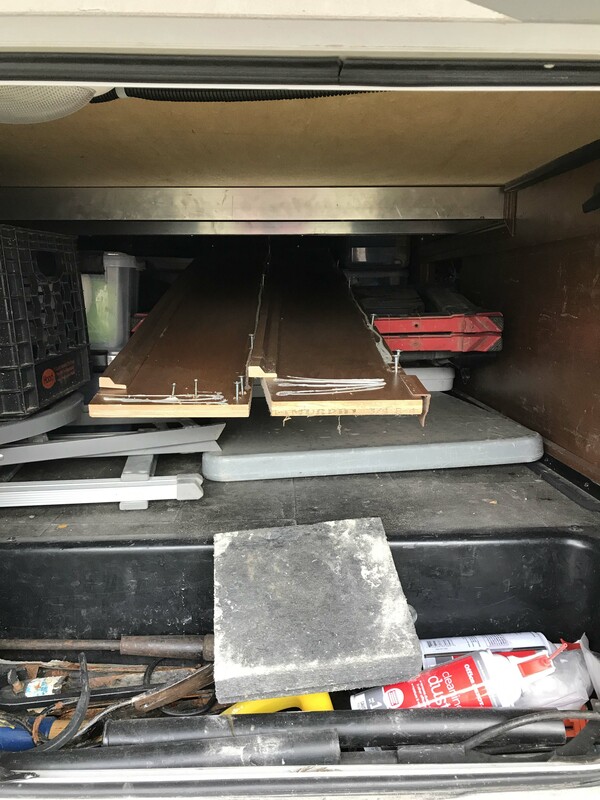 So we kept kicking that particular repair can down the road, but Lee was getting more and more concerned, because it was obvious to him that the floor was “soft”, and starting to bulge downwards to the point where the slide was struggling to come in. To me this didn’t look so bad, but you might see that the floor was “bowed” and Lee was worried that eventually the bottom would drop low enough that it would no longer fit through the hole. To be clear this problem was my fault and not a manufacturers defect. One of the days where we were trying to move quickly I left a bottle of fabric softener outside of the washer (where it usually goes when we travel) and the lid popped off, spilling a ton of softener onto the floor. 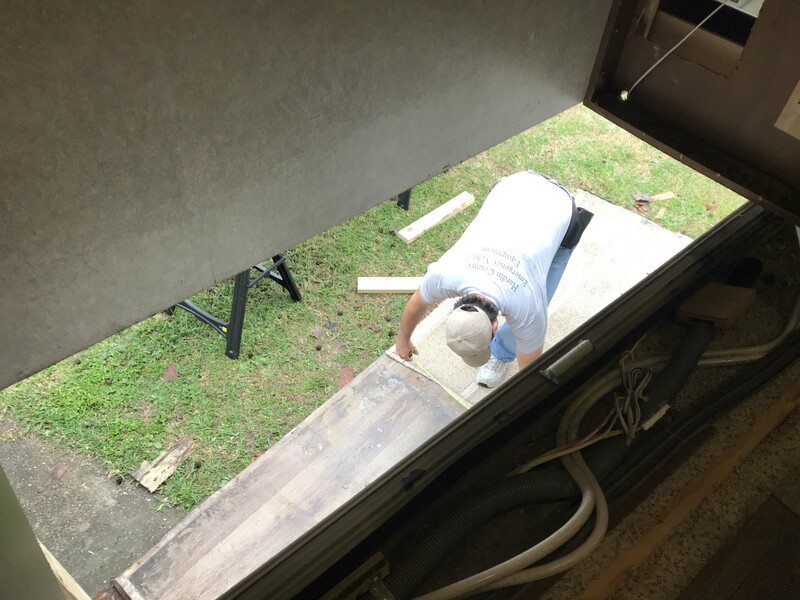 That was a big problem because it seeped through the joint between the slide floor and the wall of the slide, and soaked into the wood of the floor. 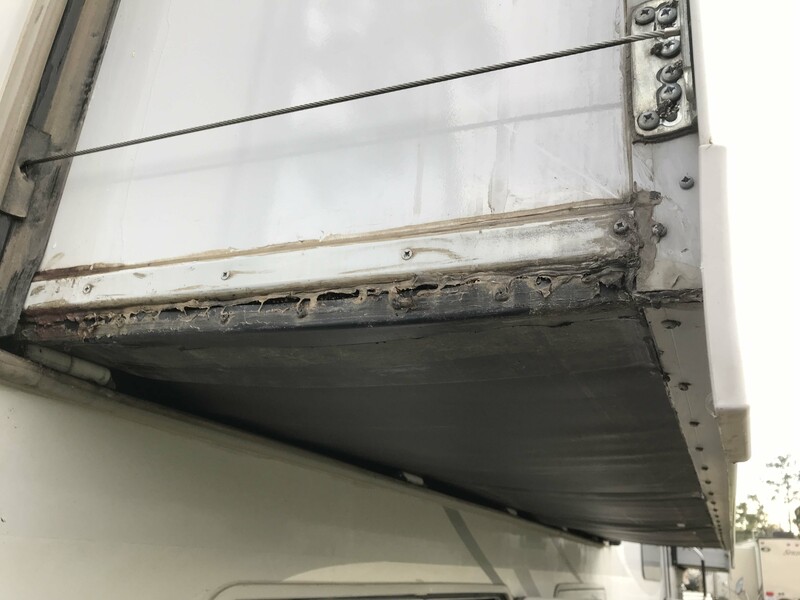 Unlike water, fabric softener does’t evaporate, or at least not in that sealed up environment, which resulted in the plywood floor swelling and softening over time, and the bottom of the slide floor sagging down. I was shocked when I saw this, but it was exactly what Lee expected to see. But I am jumping ahead. 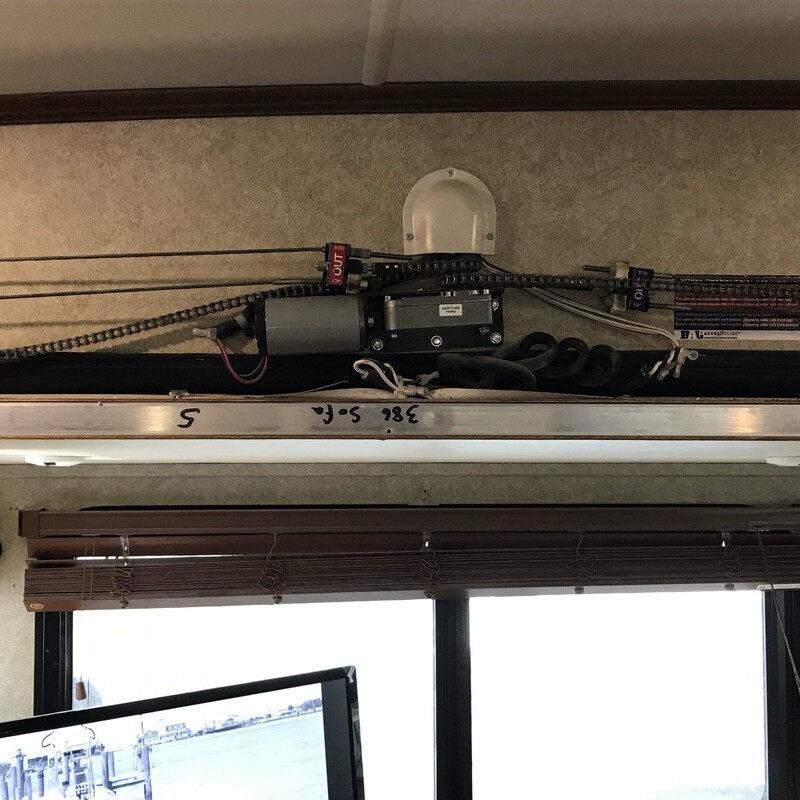 Because our particular model was only made for a few years, it is hard to get solid information on it, so Lee joined an Open Range forum and some Open Range Facebook groups in the hopes of learning more about our rig. 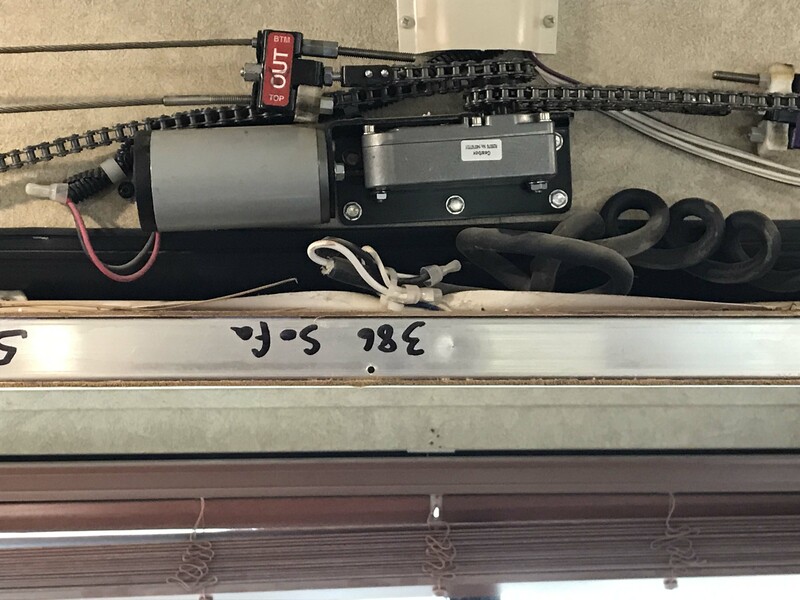 While he was reading various threads he discovered an RV Tech named Danny who really seemed to know a lot about Open Range rigs. 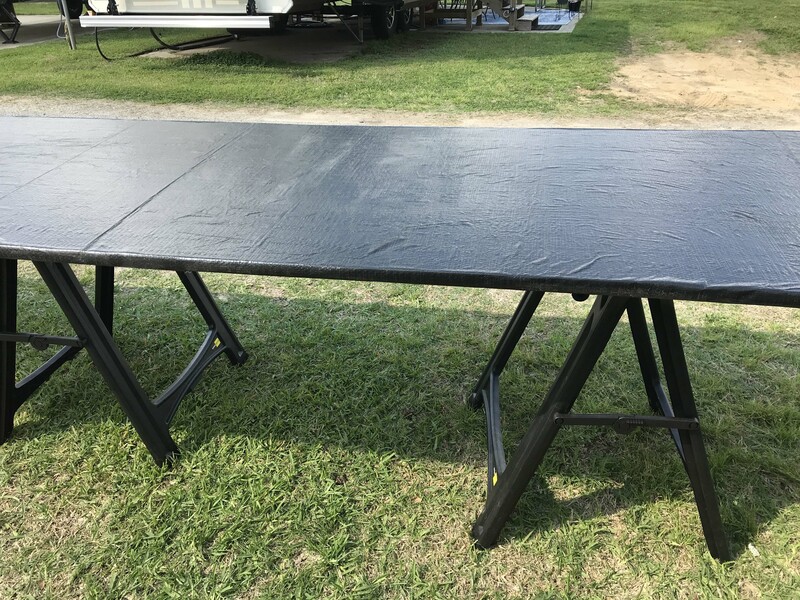 Danny lives in Texas now, but he used to work at the Open Range factory in Indiana and he not only had experience working on our particular rig, but had significant experience replacing slide floors. 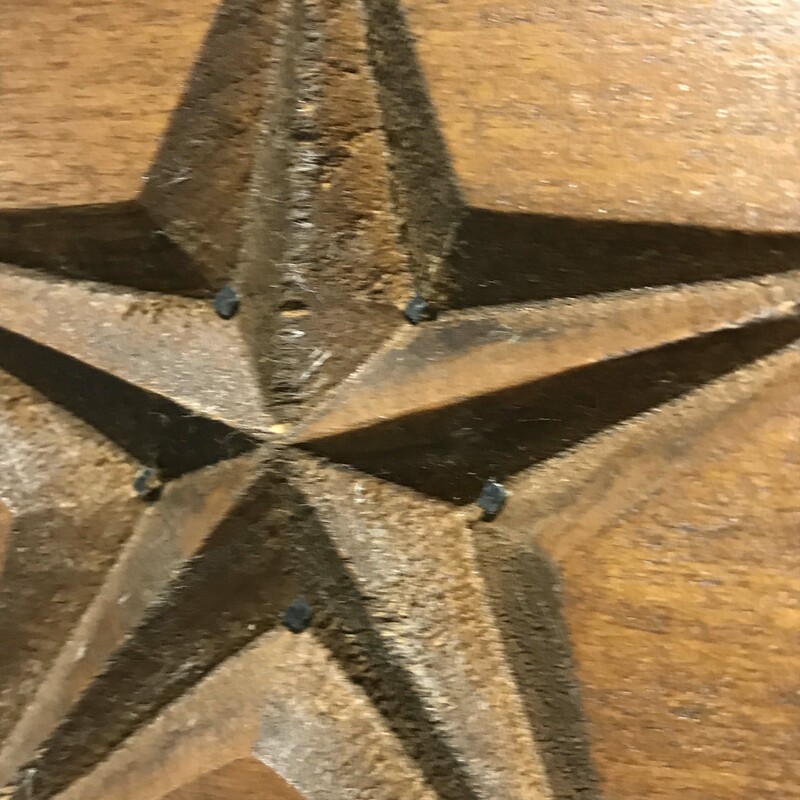 Since he is now in Silsbee, Texas, which was roughly 6 hours away from Kenedy, Lee reached out to see if he could possibly perform the work. 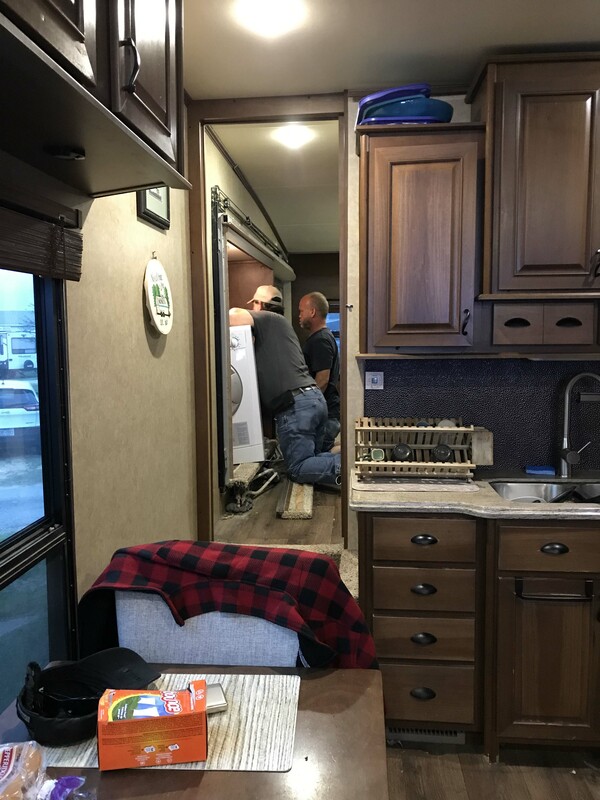 Danny works full time for an RV service center, but also takes weekend jobs on the side, so we made an appointment with him to get the work done over the weekend. 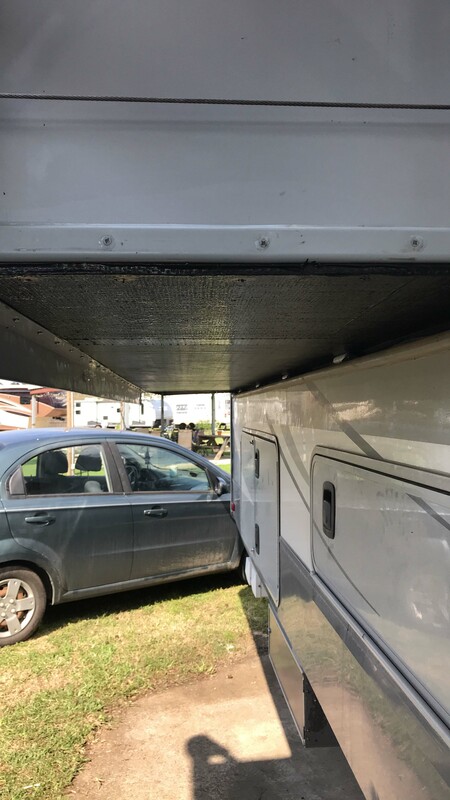 Initially we had made reservations at Thompson Lake RV Park, but we arrived a day early and no one was in the campground office, and there were no late night check-in procedures posted. We had no idea where to park or how to pay, so we went next door to Red Cloud RV park hoping they would have a spot for us. 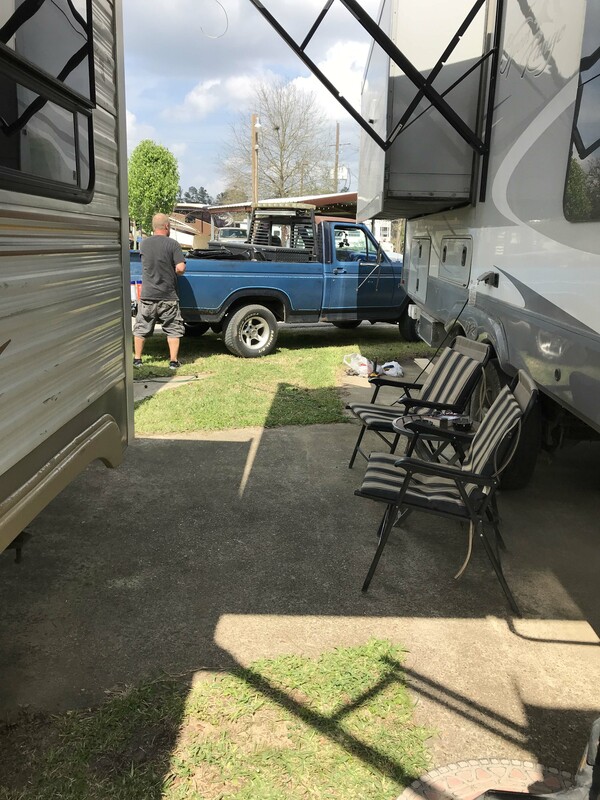 It’s a really nice park, and clean as a pin, with great laundry facility and one of the nicest clubhouses I have ever seen, but the sites are on the small side and pretty close together, so keep that in mind if you like lots of room between sites or have a big rig. Thankfully the manager was kind enough to work with us and found us a site we could stay in for four days. Even though the job was roughly two days of work, we were all concerned about the weather. The forecast called for thunderstorms every day and we weren’t sure how that would effect the schedule. Danny could do the work in light rain, but not thunderstorms, so we crossed our fingers and hoped for the best. In order to help with the weather, Danny was willing to be flexible with his schedule and came over after work Friday night to take a look at the job and do some of the prep work. 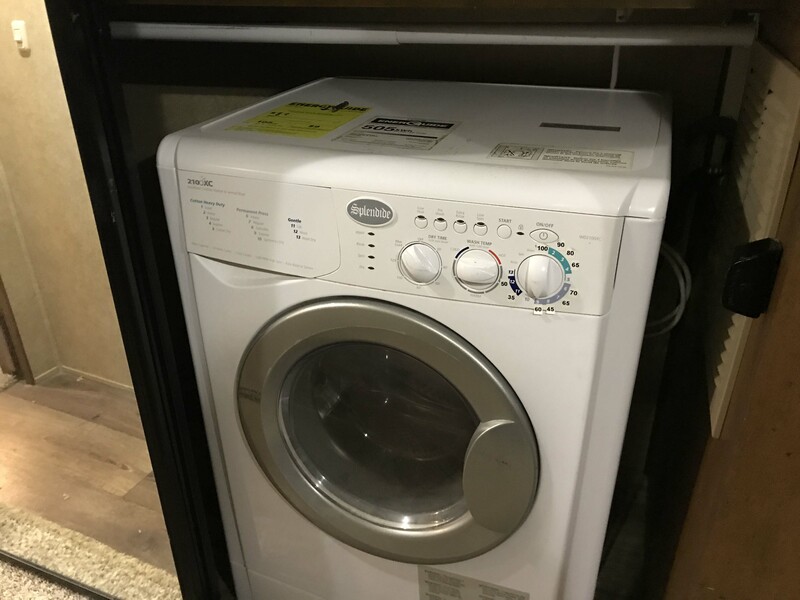 He disconnected and removed the washing machine, no small task in itself, and was joined by James at the end to move the machine itself. Despite having limited space, they were able to move it into the corner of the bedroom so we were still able to access our clothing and our bed. We had taken everything out of the drawers and closet and all of that was up in the front of the rig. But despite being in a state of construction, it really wasn’t that bad, and I could easily access everything I needed. James and Danny disconnecting the washing machine. 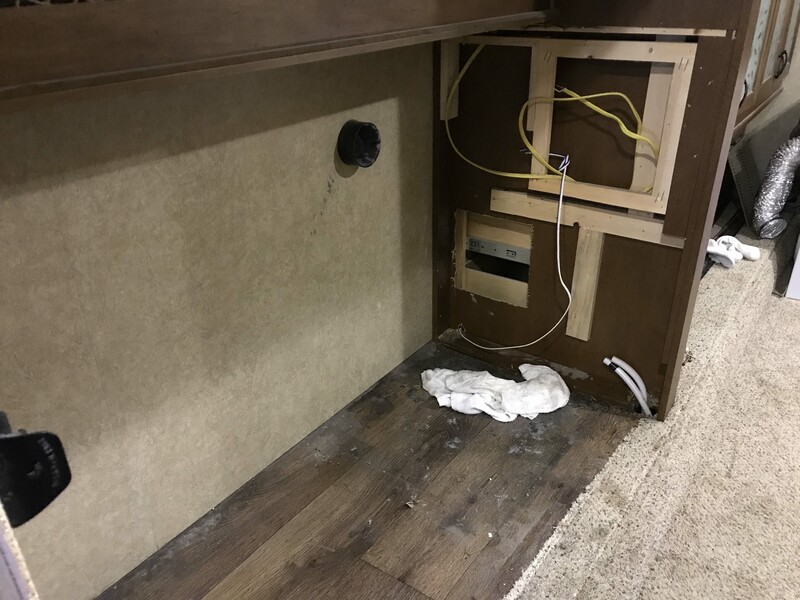 They had to remove the entire side panel to also disconnect 12v and 120v power, and the water and drain lines. The empty space. Where the wood pieces are on the side wall had an additional panel that was removed. At this point it was getting dark so they measured the floor and then left for the day. Danny was pulled to do a job by his regular employer the next morning, but as soon as he was done he and James came over. 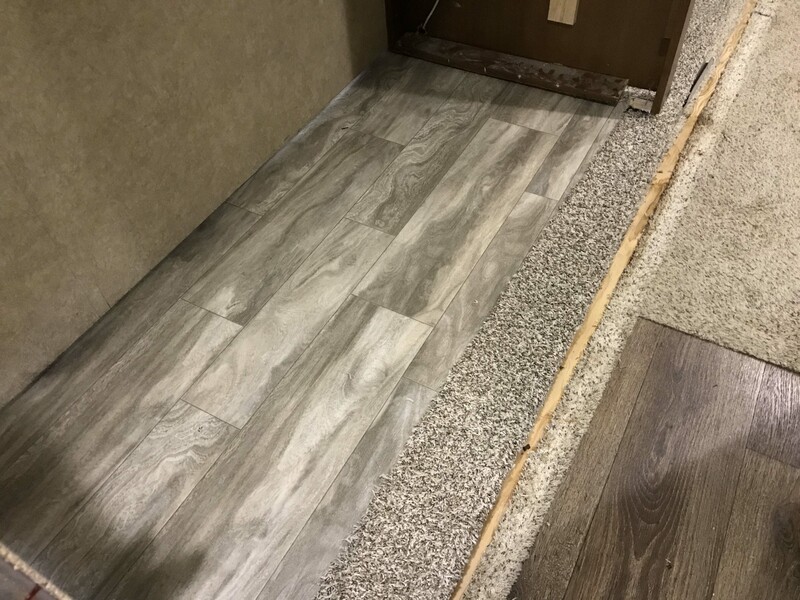 Despite the forecast it didn’t rain and they were able to build the new floor with two layers of 1/2″ marine plywood with staggered joints to make an 11′ long piece that is glued and screwed together to make a single piece of 1″ floor. Then they covered it in adhesive and wrapped it in a thick “tarp-like” sheet. The edges are wrapped, and the end edges which are exposed to the outside are double wrapped. 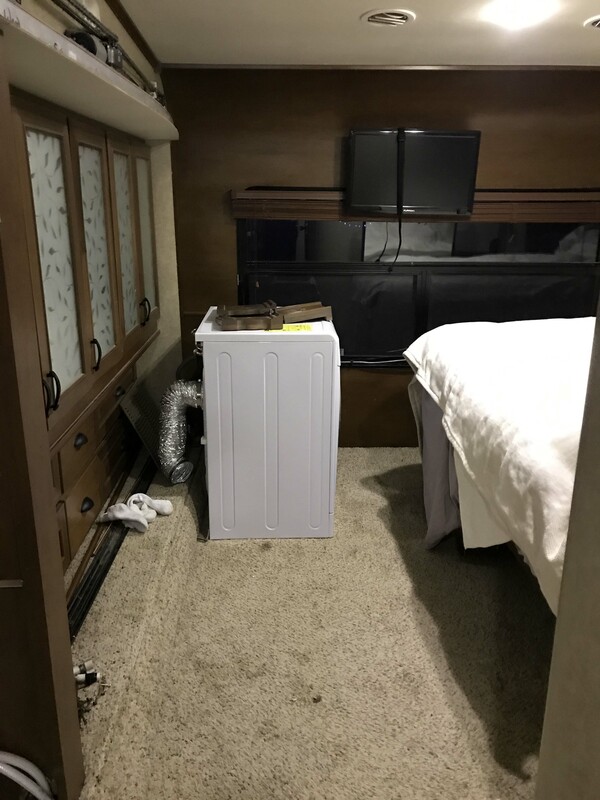 This sheet is specific to the RV industry and is not cheap as the remnant piece he used cost $100. That is the key though to keeping the wood protected from the elements and Danny took his time putting it on, making sure it was as smooth as possible. The new floor before being covered. Covered piece before all the bubbles were rolled out. They finished this around 4pm, but again decided to stop because they wanted to make sure they had time to complete the next part. 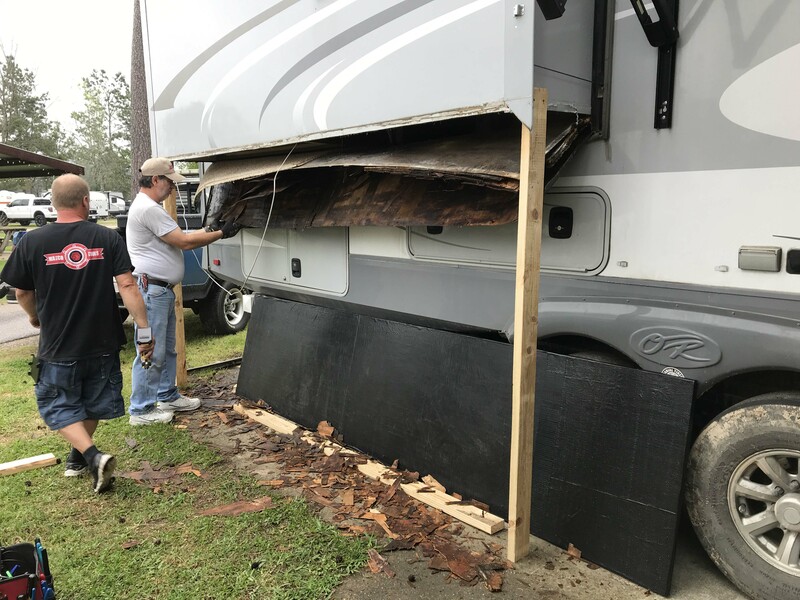 Once the old floor was taken out our RV would be open to the elements and they wanted to make sure they could complete that portion of the job once it was started. Since we weren’t even scheduled for him to work on it until Sunday, I completely understood, but was worried there were a lot of tasks left. They assured me though that the hard part was done and that turned out to be completely true. The next morning they started by 9am and jammed through the rest of the repair. It was amazing how fast it went. We didn’t get as many pictures of the various steps in the process because every time we stepped away for a minute and came back, two things had been done while we were gone. 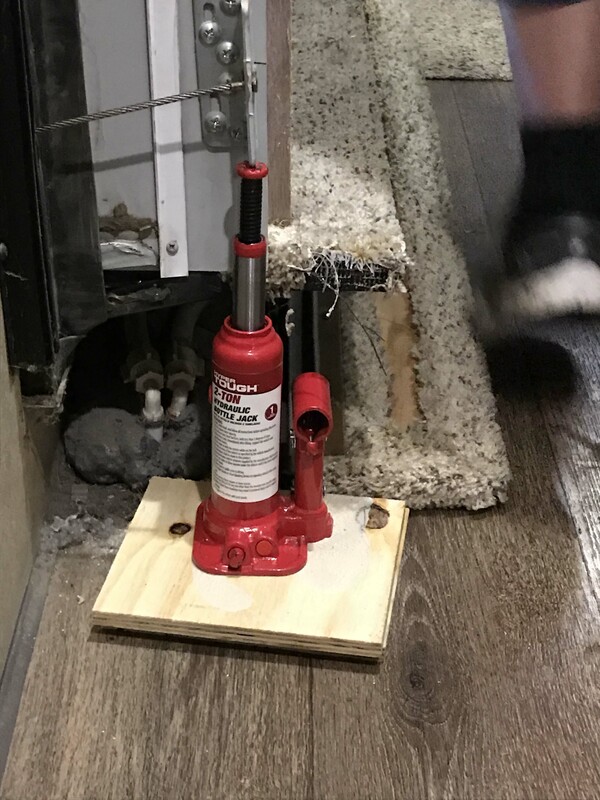 They used 2 x 4’s to hold the weight of the slide above the rollers so it would “float” once they removed the old floor, and small bottle jacks on the inside to hold up that side. I was very pleased that the cabinetry above the floor was completely dry. Only the floor was damaged. But the closet side was a mess. James had to pull some of this out by hand. Once the floor was out, the slide was completely open to the elements, but again despite the forecast thankfully no rain. Next they put linoleum on the side of the floor where the washer/dryer and hanging clothes go. Lee actually liked this lighter shade better than the darker stuff that was originally in there. And then added carpet for under the drawers and the front part of the closet side. Lee counted about 1000 staples were used to hold the carpet. Give or take. Everyone was really worried about the carpet, because Danny checked and they didn’t make our particular color anymore. Even if they had it wouldn’t have been a perfect match since our existing carpet has three years worth of wear. Danny found something that was very close and I was completely fine with that. I know this would have been a big deal to some people, but I have always been a more function than form kind of person. 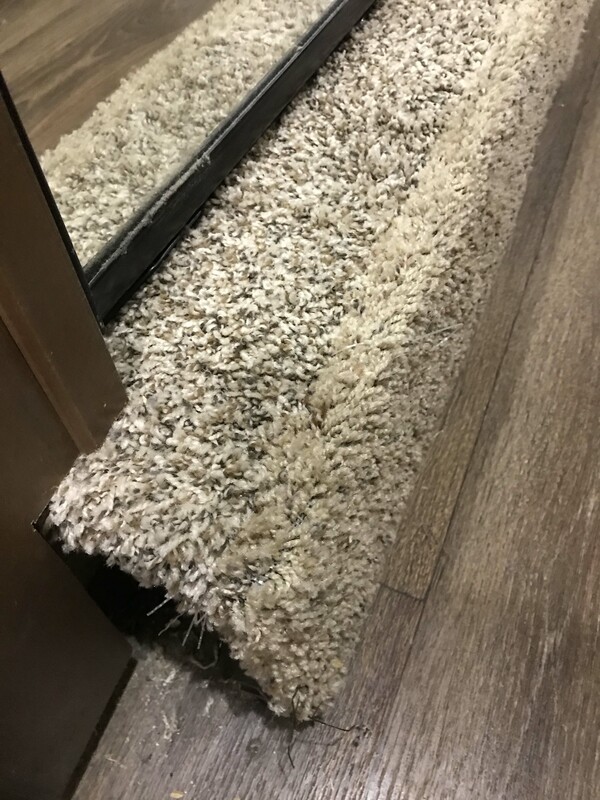 And you can see new (on top) versus old (on front) carpet, but with the lighting and the corner I thought it looked really great. 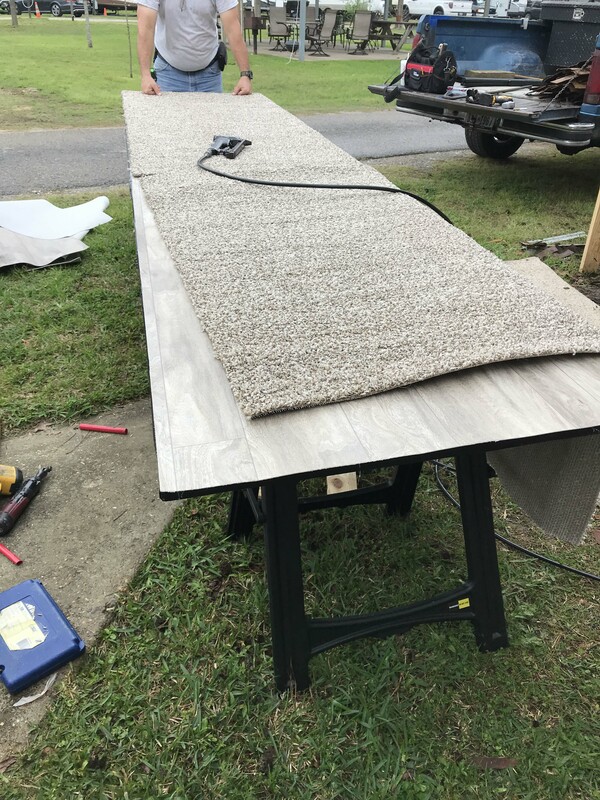 The extra carpet was trimmed off the end and the edge of the floor was then covered with metal trim that they had removed earlier. By the way they screwed the wooden supports into the slide which I thought was interesting. And the washing machine was reinstalled and works great. We ran a test load while they were finishing cleaning up. All cleaned up and looks like new! I was thrilled, because everything was so clean and neat I honestly couldn’t tell he was there. That to me is the mark of a perfect repair and I was beyond thrilled. 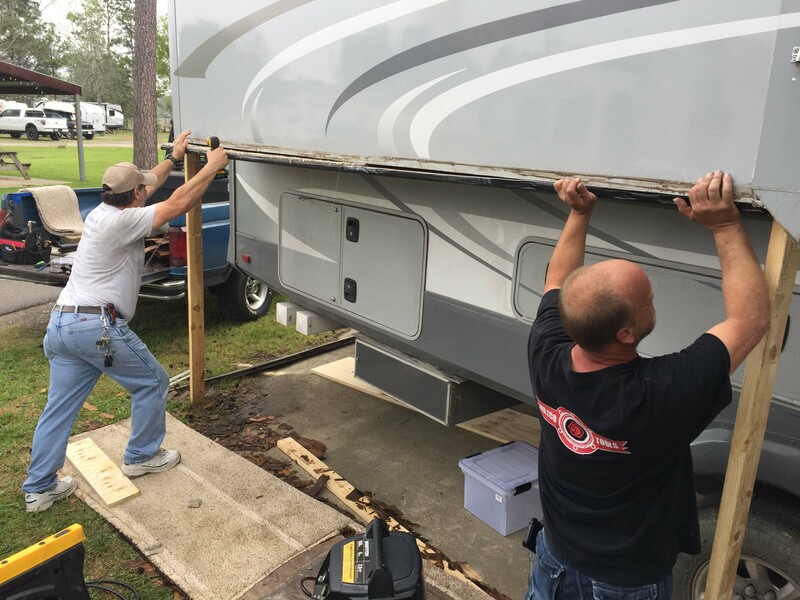 The guys were done by early afternoon and took a break, but Danny came back to adjust our front slide cables. One of the other reasons Lee really wanted to see Danny in particular was because our slides haven’t been adjusted right since we started on the road. Again, my fault, as early on I put stuffed animals up into the slides and actually sucked them into the slide mechanism. Yes, true story, and incredibly stupid and the slides haven’t worked right since. Lee has tried to adjust them and we have had other people do it as well but they have never been right. 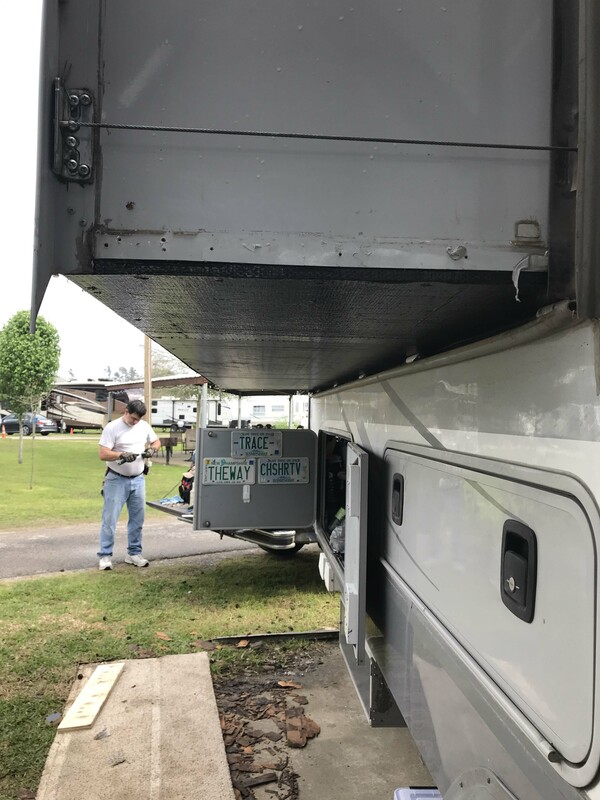 Danny has lots of experience adjusting them and the first thing he showed us was how the fascia comes off so you can easily get to the mechanism. 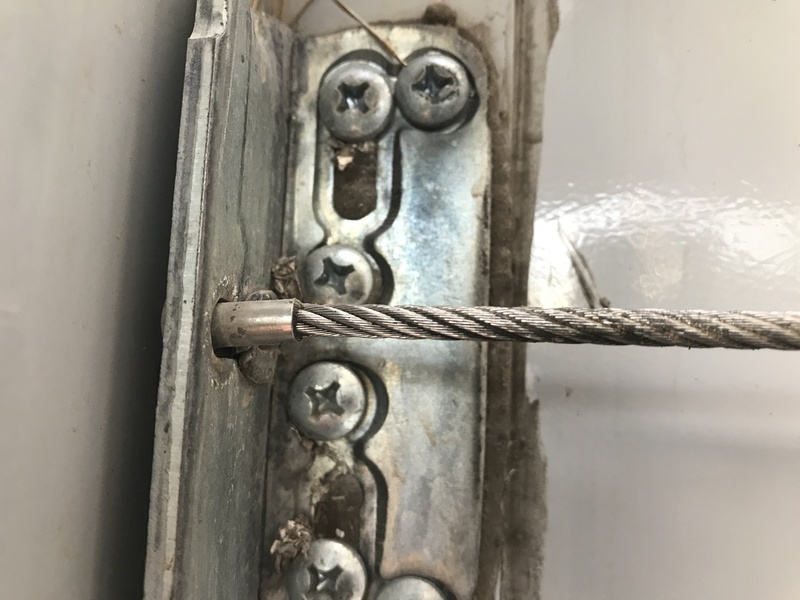 Turns out there are 5 tiny nails holding it in place, which we never knew, and removing it makes working on them 100 times easier. None of the techs we had look at it removed the front which might have been part of the problem! Tiny nails in the star which is why we never saw them. That star is about 2 inches tall, for reference. You can see how loose the chain on the left side is, it was completely out of adjustment! We were very excited that someone who knew what he was doing was going to work on it, but then it happened. 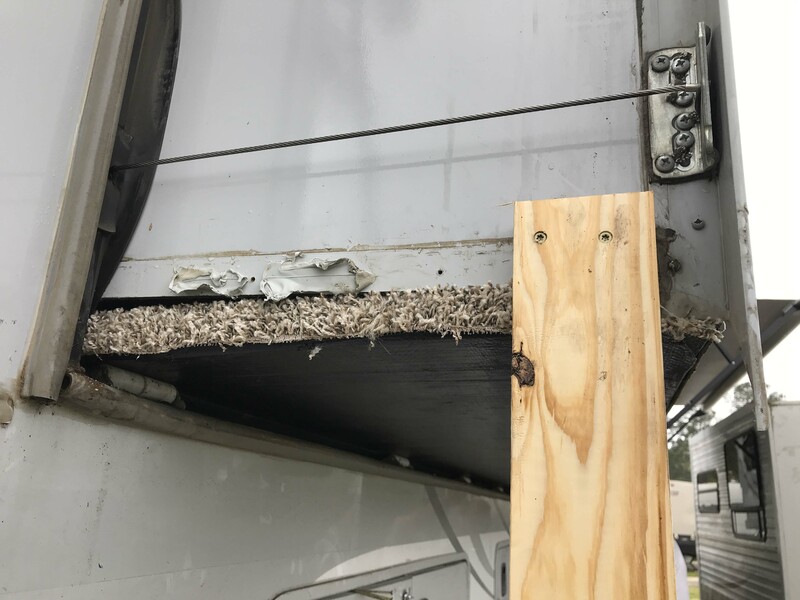 He adjusted the desk slide, but was concerned that one of the tension lines showed signs of wear, and looked like it should be replaced as soon as possible. When he started working on the couch slide, the bolt attaching the cable to the chain snapped almost immediately. It definitely wasn’t his fault, because both lines had been under significant pressure over the last few years and he was surprised they hadn’t broke before now, and apparently the last person who worked on it put it back together wrong, so every time it went in and out it put too much strain on the bolt. The problem was this isn’t that common of a part and not one his shop had in stock. We found it on Amazon but that would take until Tuesday, so Lee started making calls first thing Monday morning and found two of them in stock (only $26 each) in Houston. It was 120 miles each way to get the parts, but a bird in the hand as they say, and Lee was more than willing to make the drive so we wouldn’t lose another travel day. Thankfully the RV park had space for us to rent another night and Lee left first thing to go get the items we needed. Once Danny came back and dug into it here’s what he found on that first slide which had a cable that looked like it needed to be replaced. 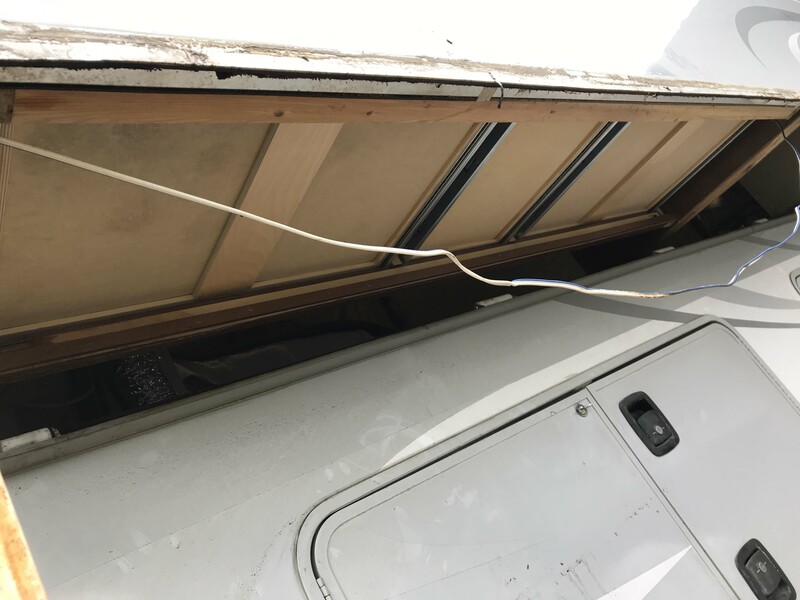 Needless to say, we were totally shocked, but again, we learned something and I have to say how impressed we are with how these cables hold up. It was still working despite the fact it was down to just a couple of strands. And now we know what to look for when they are starting to go bad, and where. Yep, that’s it. 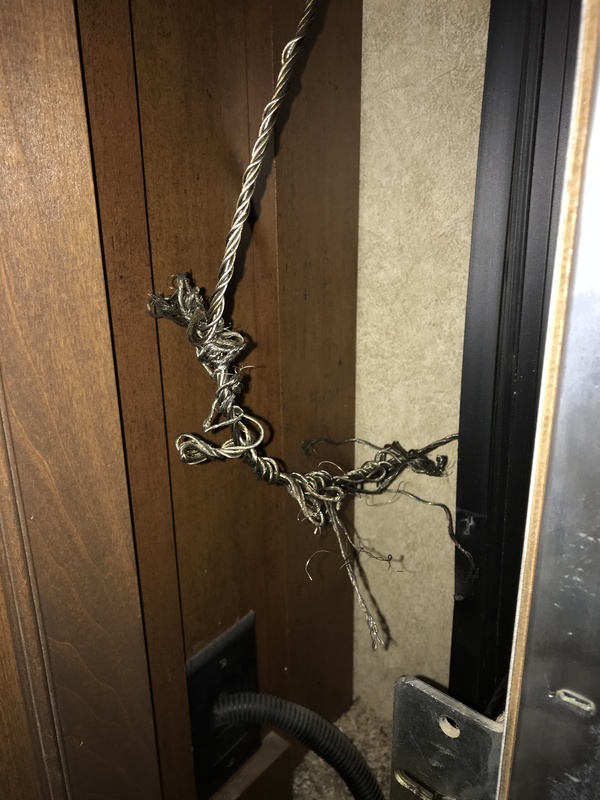 This picture was taken after he cut the cable to replace it, but this rat’s nest of snapped and frayed strands was located in a corner behind a piece of fascia. There’s really no reason a person would ever look back there, but now we know to look there to check on the cables. There are 8 points per slide to check, 1 on each corner inside and outside. This is a good one. This is showing signs of wear. 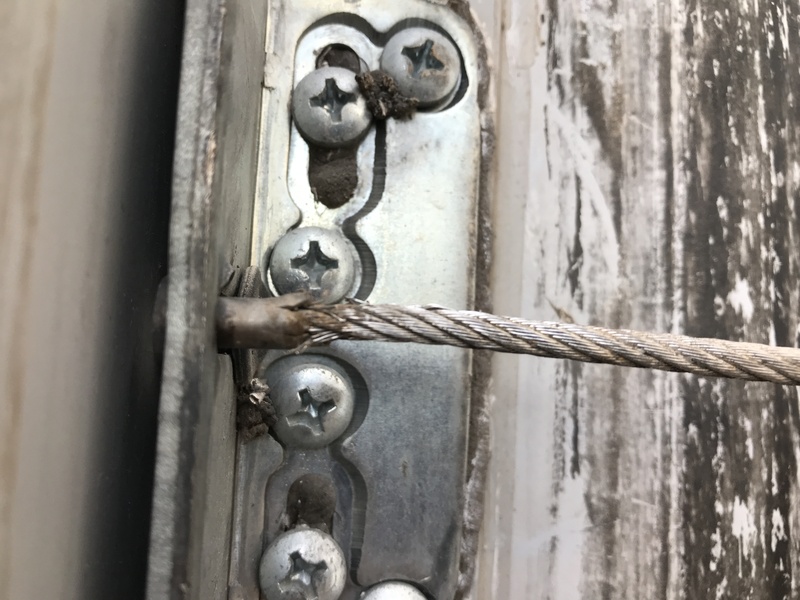 This cable will need to be replaced before it looks like the one behind the fascia. I will also say Danny did an excellent job of threading in the new cable. He got each one done in under 15 minutes, compared to the two hours another tech spent on it a year or so ago, and then he adjusted and tested them. I asked him if I could share his contact information and he was happy to put it out there. If you are in the Houston/Beaumont area and need work on your BAL accuslides or slide floors, I highly recommend him. His name is Danny Ritchie, and he can be reached at 260-585-3219. He was definitely worth the trip. 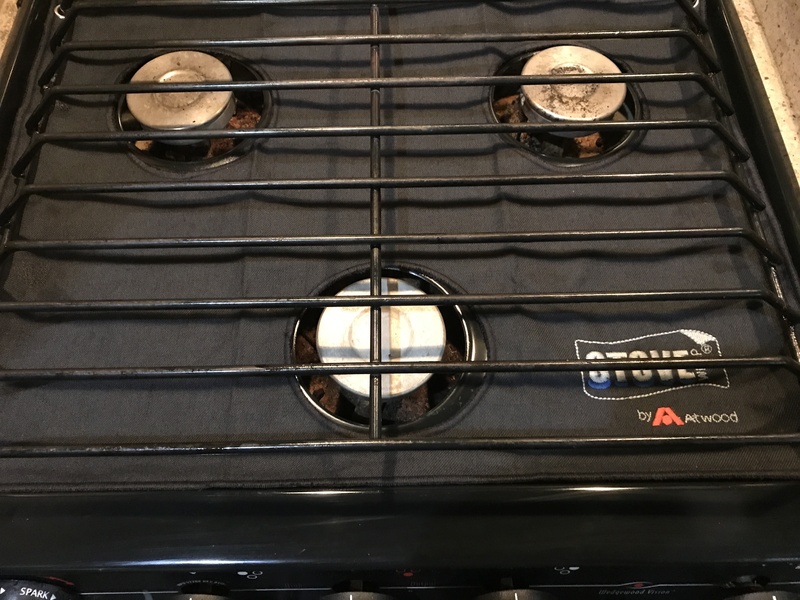 Oh, and to end on a positive note, while Lee was at the RV Dealer in Texas, PPL, he picked up a supposedly non-flammable oven cover. I hate how hard these ovens are to clean and it is both fire proof and washable according to the box. We will test it out and see. This entry was posted in Lakeside and tagged BAL Acuslide, Replacing slide cables in Open Range, Replacing Slide floor. Bookmark the permalink. Looks crazy but must be a relief to have it all repaired. Can you imagine if the floor just fell out? Yikes! Nice that you found such a great tech. All I can say is wow. I’d like to give this up to good timing, but I’m thinking that timing was skewed by a bit of divine providence. 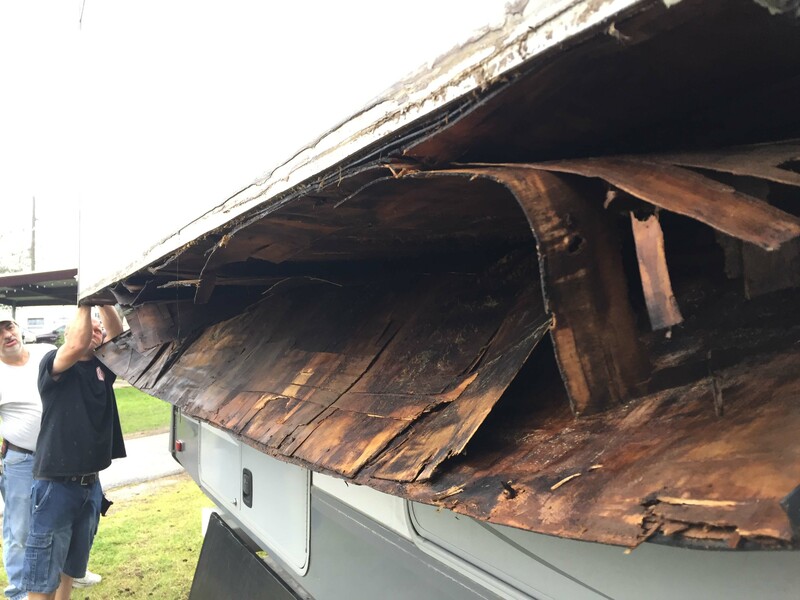 Glad you had the time and resources available to get that taken care of before you got up here to your job in Oregon where you’re going to be relatively remote when it comes to repairs such as that. But thanks for the education, one more thing to add to the list of stuff to keep track of. I agree with divine providence as well but Lee’s research certainly pointed us in the right direction ! All I can say is “wow!” What a job! 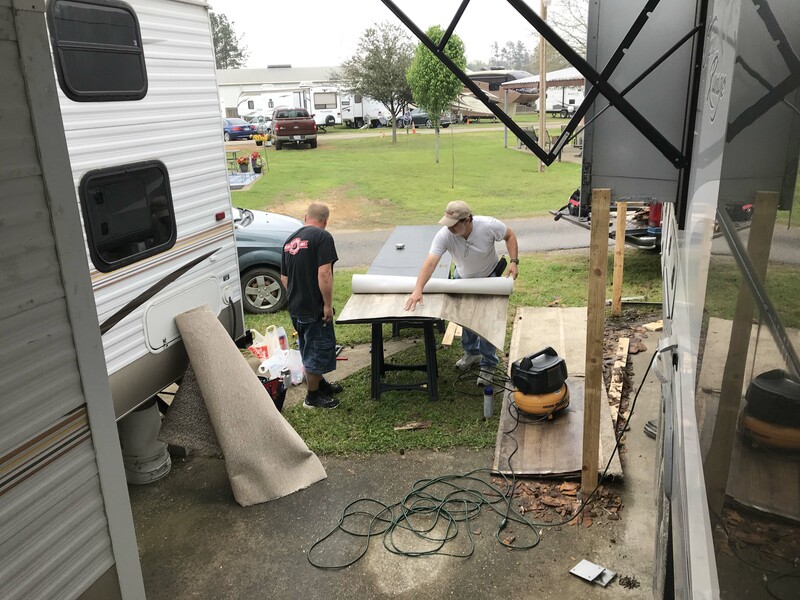 I’m glad they were able to do it at the campground; we needed our slide repaired a few years ago and had to leave it at the shop for about 2 weeks! You might want to consider adding a Splendide Washer Drain Away Pan. 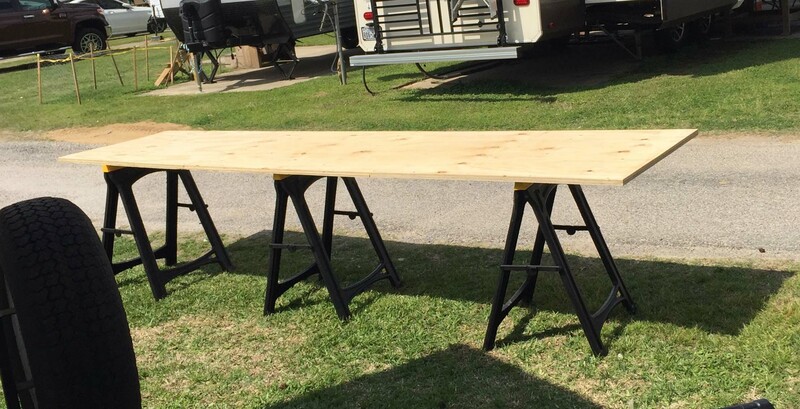 We had one in our 5th wheel under our Splendide, and my husband said it was well worth the trouble of installing it. While I realize you didn’t have a water leak that caused this, water has a way…….. Interesting. I’ve never heard of one of those but will definitely mention it to Lee. Thanks for the info! Thank goodness for Danny R., he is my go to for any questions for our Open Range. You got the best. What a great job and for a great price!